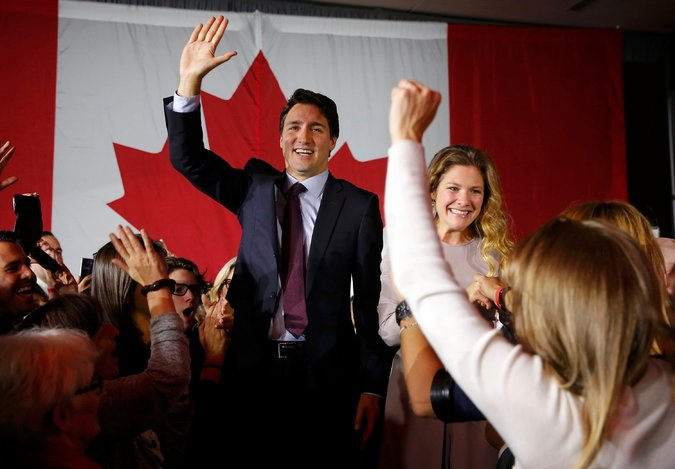 Justin Trudeau of the Liberal Party and his wife before giving his victory speech in Montreal, Canada. Suddenly a new political star has risen. His name is Justin Trudeau, he’s 43-years-old, and his Liberal Party came out on top in Monday’s Canadian national elections ~ effectively ending the Conservative Party’s nine-year-long neo-conservative stranglehold over Canadian politics. As Thom Hartmann writes ~ "No one saw this coming. Back in August when current Prime Minister Stephen Harper first called for early elections, the Liberals were getting trounced in the polls by the historically much more left-wing New Democratic Party, or NDP … At that time it really looked like the Liberals - Canada’s so-called “natural governing party” ~ were on the cusp of losing yet another election…. But then something weird happened. As summer turned to fall, the NDP abandoned its progressive values and started moving to the right." The die for defeat was cast and the people spoke much as they are now in the United States and the UK. As Hartmann correctly explains ~ Unfortunately, a lot of establishment Democrats still buy into the right-wing myth that America is a “center-right nation” when it’s anything but a center-right nation. Like Canada, America is a center-left nation ~ despite the mainstream media attempts to convince us otherwise. In fact, a recent poll by the Progressive Change Institute, shows that Americans overwhelmingly agree with progressives like Bernie Sanders on key issues from education and healthcare to the economy which explains Sanders continuing polling strength ~ because he is speaking to main street and not mainstream corporate America. That's an incredible voter base and Sanders is directly tapping into it as did Trudeau in Canada. Now you can better understand why Bernie Sanders is continuing to gain traction while the mainstream media can't believe it ~ and mainly because they are corporate stooges, like CNN's Toadie Anderson Cooper, who are drinking their own Kool aid and can't believe that their own focus groups and the public forums consistently felt that Sanders won the last Democratic Debate whereas they felt that Clinton was the obvious winner. Sanders is speaking to American's concerns and wishes ~ while Hillary is obviously pandering for their vote. Now watch how far and how rapidly Bernie Sanders has become the front runner in the upcoming Democratic Presidential primaries ~ by telling the truth about our unequal social security system and other concerns while in the process becoming the true voice of the people. Canada was risen from a long neo-conservative nightmare and it appears the United States is now beginning to realize the very same real possibility with Bernie Sanders. As Harrison Finzel writes in The State Press ~ " Forget about policy for a minute; there is something more important than tuition-free college or single-payer healthcare that Senator Bernie Sanders (I-Vt.) is offering the American public: himself. He has rightfully become the channel for the middle class (and, increasingly) lower class American rage at the socio-political-economic establishment that has crushed the American Dream for anybody paying a wink of attention. Like the great George Carlin said, you have to be asleep to believe it. That has never been truer than today." "It's important that people understand who I am and where I come from and not just have it shaped by purely political discourse."